PROPERTY developer Ken Holdings Bhd plans to develop half of its 56ha land in Shah Alam, Selangor, and Bangsar in Kuala Lumpur, with a projected total gross development value of RM650 million. "This is sustainable to the group over the next four to five years," managing director Tan Boon Kang said after the group's annual general meeting in Kuala Lumpur yesterday. The group is developing a low-cost apartment and shop lots on the Shah Alam land, while a high-end serviced apartment is being developed in Bangsar. Another 26ha of land area is located in Perak, Penang and Genting Highlands, Pahang. Ken Holdings, which has about RM22 million cash in hand and zero gearing, is continuously looking to acquire more land especially in Klang Valley and other cities in the country. "We are always on the lookout for more land, but there is nothing solid right now as we are still focusing on our existing land bank," Tan said. Commenting on whether the high price of raw materias will effect the group's performance in future, Tan said: "All house prices will ultimately go up due to escalating prices in raw materials. We will have to eventually pass these down to purchasers." Ken Holdings posted a RM8.4 million net profit for its financial year ended December 31 2007 against RM3.9 million previously. Revenue was reported at RM60.2 million. Tan said he expects Ken Holdings to maintain its performance this year attributed from existing projects. The Employees Provident Fund (EPF) expects a minimum annual return of RM16 million from the purchase of its latest commercial building in Putrajaya for RM258 million. EPF signed a sales and purchase agreement with Putrajaya Holdings Sdn Bhd yesterday to buy the 26 Boulevard building in Precinct 3, Putrajaya. "We expect the income from this building to produce an annual net yield of more than six per cent based on the purchase price," said EPF deputy chief executive officer for investment Johari Abdul Muid at the signing ceremony yesterday in Putrajaya. EPF expects its income from its real estate investments to grow by 77 per cent to RM150 million this year, said EPF chairman Tan Sri Samsudin Osman during a press conference. It made an income of RM85 million last year from real estate, 37 per cent higher than RM62 million in 2006. EPF invested RM1.78 billion in real estate in 2007 or just 0.6 per cent of its total investments. Its portfolio includes properties such as the SOGO shopping mall, Wisma KFC and a building in KL Sentral. Samsudin said EPF did not have immediate plans to invest in foreign real estate as it wanted to focus on the local market. However, EPF has plans to invest in foreign Islamic bonds. It is now studying its options. As for 26 Boulevard, more than 90 per cent of the office and retail space in the building has been taken up. "The occupants include government departments and also those from the private sector," he said. The tenants include a department from the Ministry of Health, People's Volunteer Corp, Civil Defence Department, NZ Retails Sdn Bhd and a private clinic. The 26 Boulevard is a low-density 13-storey building with a 0.812ha foot print and 47,890 sq m of gross floor area. SENAI: Senai Airport Terminal Services Sdn Bhd (SATS) is investing RM70mil in the Aero Mall project, Malaysia’s first stand-alone and external airport mall. Of the mall’s total space of 9,290.304 sq m 100,000 sq ft), 3716.121 sq m (40,000 sq ft) is retail space and the balance the concourse. SATS general manager finance and retail development Chan Kwai Yew said the company wanted to position and market Aero Mall as the area’s new lifestyle hub. “Shopping, dining and entertaining at airports is getting popular now as airports are no longer just for air travellers,” he told StarBiz recently. The groundbreaking ceremony will be held today. The project is scheduled to complete in 18 months. Chan said the best example of such a concept was Terminal Three at Singapore’s Changi Airport which had successfully attracted non-air travellers and residents from nearby areas to shop and dine there. He said Aero Mall’s target markets were the business community, employees in the nearby industrial estates and the population in the Senai-Kulai area. 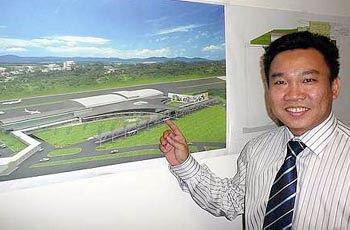 Chan said the mall would be connected to the present airport terminal building and constructed on the existing open air parking area. A new basement parking area would also be built. He said the new mall, an extension of the airport’s present retail segment, would offer air and non-air passengers more choices to shop and dine, adding that the airport received overwhelming response when it introduced mid-level lifestyle products. Chan said between 4,000 and 5,000 air passengers currently used Senai airport, which provided an active market for the existing 25 retailers. He said among the new mall’s outlets were Secret Recipe, Kyros Kebab, Chocz, SASA Hong Kong International, MPH Bookstore, KFC, Laksa Shack, Starbucks, Nationwide and FedEx. Concurrently SATS would also be launching the Senai Free Zone (80.937ha) and Senai Aviation Park (40.468ha), he said, adding that both would create some 20,000 job opportunities. The Free Zone will house a mixture of SME operations, warehouses and logistics for parts and components that could be exported via air cargo at Senai Airport. The Aviation Park focuses on maintenance and repair operations for the maintenance of smaller aircraft engines and avionic products like radios and meters. KUANTAN: Tunas Manja Group’s RM110mil flagship project, AmberHill in Taman Melawati, Kuala Lumpur, is scheduled to be completed by June next year. Located on a 3.8ha site, the gated community project offers 20 bungalows and 30 semi-detached houses set in elevated ground and lush green surroundings. According to managing director Y.K. Chin, AmberHill comprised luxurious homes of innovative designs and layout with quality finishing. He said each home was smart equipped with remote controls and monitoring with built-in home alarm systems and Internet connection. “The bungalow offers a land area of 6,500 to 14,000 sq ft and has seven or eight spacious bedrooms, a private outdoor pool and has three levels. “The semi-detached home has seven spacious bedrooms, a built-in jacuzzi and also comprises three levels,” Chin said in an interview recently. The semi-detached units are priced from RM1.6mil to RM1.9mil while the bungalows are priced from RM3mil to RM3.2mil. Chin noted that since AmberHill was located on elevated ground, the company had taken extra efforts to ensure the project was a safe and solid one. “To ensure sound slope protection, micro-piling was adopted to preserve the environment from harsh construction work. “Although micro-piling is relatively costly, it is money well spent as we prefer to invest in the safety of the houses we build,” he added. Tunas Manja started in the early 1980s as a supermarket operator that later branched out to food processing and wholesale retailing. In 1992, Chin, who has a background in civil engineering, entered the property development scene with a mixed development project called Taman Tunas Manja in Kuantan. Since then, it has completed a mixture of residential, commercial and industrial properties, all in Kuantan and its surrounding area with a total sales value of close to RM175mil. The group’s property development arm, Tunas Capital Sdn Bhd, has several ongoing projects, including the RM91mil D’Embassy in Kuantan, comprising one condominium block and one serviced apartment block. Chin said the group was always looking for opportunities to expand its property development activities in the Klang Valley but limiting its ventures with smaller projects as they would be easier to plan and manage. PETALING JAYA: Ken Holdings Bhd has projects in hand with a gross development value (GDV) of RM650mil, which would keep it busy for the next five years. Managing director Tan Boon Kang said the group was also looking for land in the Klang Valley, Penang, Perak and Terengganu to add to its land bank. “We are looking for good land bank in these areas but have no plans to venture overseas at the moment due to global economic uncertainties,” he said after the company AGM yesterday. The projects in the pipeline include an exclusive serviced apartment with a GDV of RM120mil in Bukit Bandaraya, Bangsar, extended low-cost apartments and shoplots with GDV of RM30mil as well as a mixed development project with a GDV of RM400mil, both in Shah Alam. “Our Ken Bangsar project, which is expected to contribute favourably to revenue and profit, will be completed early next year,” Tan said. Last year, the company had acquired two pieces of land in Taman Tun Dr Ismail, Kuala Lumpur, for a commercial development, which would partly be used to house its corporate office. “We will use about 10% of the office space for our own use, while the rest would be rented out,” Tan said, adding that the development would provide long-term sustainable income and revenue in view of the growing demand for commercial space in that area. The company also has undeveloped land in Perak and Penang. “We have about 50 acres (in Perak) near the Lata Kinjang waterfall that is surrounded by Government-owned land,” Tan said, adding that the company was waiting to see how the new Perak government developed the land. He also said the company planned to develop 13 “very high-end bungalows'' on 2.9 acres in Batu Ferringhi in Penang with a proposed GDV of RM60mil. On the company’s outlook, Tan said any future projects undertaken by would be affected by rising building materials cost. “But we would not badly affected as we do not have financing costs,'' he said, adding that the company currently had cash in hand of RM22mil.